After The Boy Escaped From Boko Haram, He Still Wasn't Free : Goats and Soda The terror network abducted him in northeastern Nigeria. His father was killed trying to rescue him. What would he do next? This young boy was kidnapped by Boko Haram. He managed to escape, spent months in a government barracks and now lives in a rehabilitation center. He is probably around 6 years old but doesn't know for sure. Picture huge eyes, a beautiful smile and a sadness no child his age should have to endure. That is the story of a young boy who is a survivor of Boko Haram abduction and captivity in northeastern Nigeria — as well as military detention and investigation. For his own safety, we're not giving the boy's name or where he comes from. This little boy is bright-eyed and polite. He is learning English and proudly counts up to 30. He is probably about 6, but he doesn't know for sure and there is no family here to tell us. His face crumples and his eyes cloud over and well up with tears as he tells his story. "My father is dead, and my mother is in the bush," he says, speaking Hausa, the lingua franca in northern Nigeria. "It was when Boko Haram came to our village. They drove us out and snatched me and my siblings and our mother." He has two brothers. A cousin was also abducted. "When they took us to the bush, my father followed and tried to rescue us," he continues. 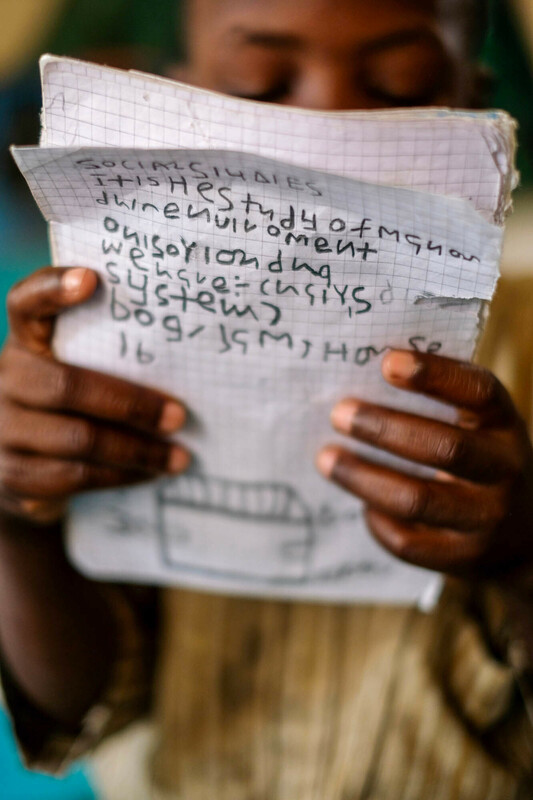 "When they realized my father was trying to take us back, Boko Haram killed him." They are just a few of the thousands abducted by the terror network, which has wreaked havoc in the northeast, killing 20,000 and driving more than 2 million people from their homes. The boy tears up at the memories but courageously continues recounting their ordeal. 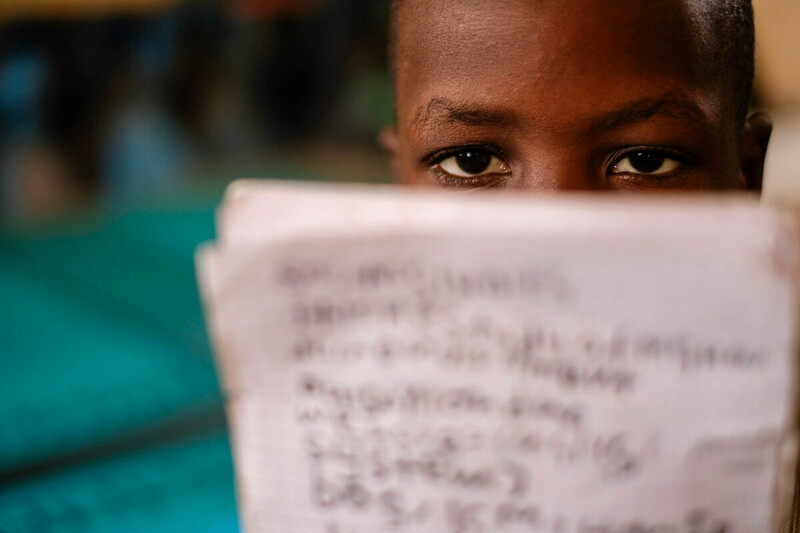 After Boko Haram insurgents killed his father, they took his family to a village "in the bush," where they attended Quranic school. He thinks they were there for about a year. And it was there that he was separated from his mother and one brother. Both are still missing. "When my father died, I became so afraid," he says. "I was frightened of staying there. And the worst thing was when Boko Haram took us away from where we were with our mother so that we could go to school. And that's how our family was split up." Now attending school, the boy is learning English and can count up to 30. Another whimper from the small boy, as he recalls what he has lived through. One night, he, his brother and cousin decided they had had enough so, under cover of darkness, they sneaked out of the village. That is how they escaped and reached a village where the Nigerian military found them. "It was the soldiers that brought us to Giwa Barracks in Maiduguri," he says. That's the main military barracks in the capital of Borno state — and the birthplace of Boko Haram. "They did not maltreat us, but they gave us instructions about what to do and what not to do," he says. "They wouldn't allow us to leave the compound. And if you fight each other or if you're found trying to sneak out of your cell, they're going to beat you. Those were the rules in the barracks." The three of them were held in military custody for interrogation and investigation for many months, says this young survivor of Boko Haram captivity. Still horrified, he describes a harrowing time with the military. "Former captives were herded in their dozens into small rooms," he remembers. "It was stifling hot and babies were dying," he says. "There were so many civilians at Giwa barracks. I can't tell you how many. And every day four to five people die there. The heat, the heat. The rooms are too hot and there's no ventilation, so people were dying. In the cells where women were being kept, small children and babies were dying every day. I was so frightened. At times, the corpses would be lying there, unattended for days on end before being disposed of." Again the child's face creases into near tears at the memory, as he furiously furrows his brow to stop himself from crying. "It was so congested there, so they let some of us go — to reduce the number of people in the barracks". In its hunt for Boko Haram insurgents, the Nigerian military has been accused by human rights groups of mistreating suspects and even former captives, including women and children, at Giwa barracks. These groups say the rescued civilians are held for many months. According to a report from Amnesty International, up to 150 people died in detention at those barracks in early 2016, including four babies and 11 children under the age of 6. But the military has denounced the accusations. "It is rather unfortunate that an organization of higher repute such as Amnesty International could release a report which is completely baseless, unfounded and source-less, with the intent of denting the image of the Nigerian Armed Forces" said a Defence Information statement in 2016. The statement concluded that there was not an iota of truth in the report and said the fight against Boko Haram "terrorists" would continue "until they are annihilated." The Amnesty International report also stated that of 1,200 civilians held at Giwa barracks in the first quarter of 2016, at least 120 were children. "Many were arbitrarily rounded up during mass arrests, often with no evidence against them," the report said. The Nigerian military says those detained are suspected of being Boko Haram sympathizers who could be dangerous or troublesome — including former captives of the group. After what he says were many months, the young boy was released into the care of government house matrons at a rehabilitation center with social workers and psycho-social support funded by UNICEF, the U.N. children's agency. But he misses his family, especially his brother, cousin and best friend, who're still in military custody for reasons that aren't clear, as well as his mother and other brother, he says. The child says he has new schoolmates and mentions the name of a new friend — another little boy — but says he is lonely. Teachers hold classes and organize activities to try to keep the children happy and busy. Wearing threadbare clothing and excited at the prospect of getting a new soccer ball to replace the one they mistakenly kicked over the wall into the adjoining compound, he is learning and getting along with the other children he now shares his life with. But the future is uncertain for the orphans and children separated from their families by Boko Haram violence and captivity. Ahmed Jaha, the Borno state commissioner for higher and special education, says helping these kids adjust to freedom is top priority for the state government. He warns that without an education, these youngsters could become the violent extremists of tomorrow. "In our enlightened self-interest," says Jaha, "these orphans, we either take care of them today or, from what I see in Borno today — with more than 40,000 orphans — whether we like it or not in the near future, they are going to be a disaster that is going to consume everybody." "If we cannot take care of them today, they will be the great monsters that are going to consume all of us." Jaha talks of establishing mega boarding schools throughout the state, where he says these children would be taught and kept out of trouble. UNICEF and other relief agencies are offering counseling and encouragement to orphans and children like this young former Boko Haram captive — and some hope for the future. Before he skips off to rejoin his classmates, the boy brightens up considerably when he starts passionately discussing soccer. "I want to be a soldier," he says at first, but then adds he wouldn't mind being a soccer player either. He's a fan of Argentina and Barcelona striker, Lionel Messi. For a moment, his boyish composure almost makes you forget who is speaking — impressive for a child who bears witness to so much suffering. "I'm quite good at heading the ball," says the boy who escaped Boko Haram. "And I'm a real team player."